The Food and Agriculture Organization of the United Nations (FAO) has released a set of 20 inter-connected actions designed to show the impact that sustainable agriculture can have on tackling the world's greatest challenges. Transforming food and agriculture to achieve the SDGs is a practical guide for countries on strengthening food security, generating decent employment, spurring rural development and economic growth, conserving natural resources, and responding to climate change. The publication is essentially a tool that offers how-to pointers to expedite actual implementation of the Sustainable Development Goals (SDGs). 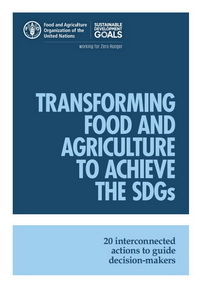 The 20 inter-connected actions can help map strategies to achieve Zero Hunger and the SDGs related to food and agriculture, including fostering more resilient livelihoods and higher productivity and incomes for rural smallholders. Each action is graphically identified with its contribution to SDG goals and reflect insights from FAO's technical expertise. For more information, read the news release and the report available on the FAO website. Kenya is one step away from commercializing Bt cotton following the commencement of National Performance Trials (NPTs) to identify suitable varieties for different agro-ecological zones. This comes after the National Environmental Management Authority (NEMA) granted an Environmental Impact Assessment license to Kenya Agricultural Livestock and Fisheries Organization (KALRO) to undertake the trials. 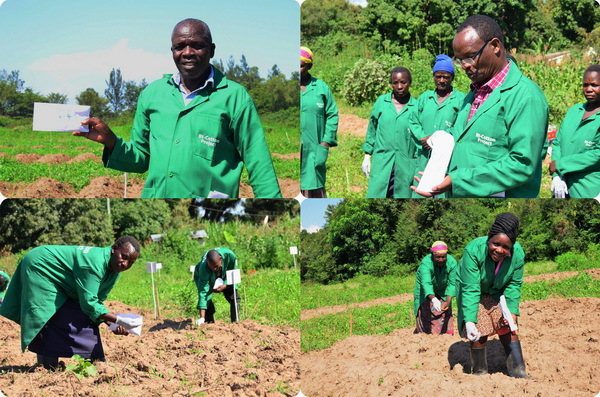 The planting began on June 11, 2018 in Kisumu, western Kenya, with KALRO's Bt cotton Principal Investigator, Dr. Charles Waturu, presiding over the event. The NPTs will be carried out in seven sites spread across six counties. GM cotton planting is a significant move in the revitalization of textiles and apparel industry, which the Kenyan government has identified as key in upscaling manufacturing and realizing the ‘Big Four' agenda, a five-year ambitious economic recovery plan. More than 200,000 hectares are earmarked for Bt cotton. 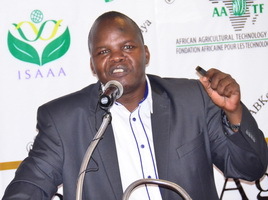 Speaking at the event, Dr. Waturu said he is optimistic that the data obtained from the trials will be adequate to allow Bt cotton varieties to be registered in Kenya, "I believe the NPTs will give way for commercialization of the GM crop," Dr. Waturu remarked. "If well-managed, farmers will be able to get up to five tons of cotton from one acre. This is a big boost and we want to move fast to ensure Kenya regains her cotton growing glory," he added. The beginning of the NPTs is a relief for thousands of cotton farmers in the country who are excited that they will reap big from Bt cotton once it is commercialized. "We are excited that today marks the beginning of an end to our woes as Bt cotton will significantly reduce exposure to harmful pesticides, boost our cotton harvests, reduce cost of production and increase our income so that we can afford quality education for our children," said James Midega, a local cotton farmer. If the trials yield favorable data, farmers are likely to access the Bt cotton hybrid seeds in April 2019. This will be a culmination of a process that started in 2001 when the first application to introduce Bt cotton was made. The first transgenic cotton confined field trials were planted in 2004 and completed in 2010. An environmental release approval by the National Biosafety Authority followed in 2016, subject to meeting some conditions among them, Environmental Impact Assessment (EIA) clearance certificate. NEMA issued the license for implementations of the NPTs on May 30, 2018. For more on biotech cotton in Kenya, contact Dr. Charles Waturu at waturucharles@gmail.com and karithikaa12@gmail.com. The United States Department of Agriculture's (USDA) Animal and Plant Health Inspection Service (APHIS) has announced the preliminary determination of deregulation from Bayer CropScience LP for event GHB811, a cotton variety genetically engineered (GE) for resistance to HPPD-inhibitor herbicides (e.g., isoxaflutole) and the herbicide glyphosate. Based on APHIS' analysis of field and laboratory data submitted by Bayer, references provided in the petition, peer-reviewed publications, information analyzed in the draft EA, the preliminary PPRA, comments provided by the public on the petition, and discussion of issues in the draft EA, APHIS has determined that cotton designated as event GHB811 is unlikely to pose a plant pest risk. APHIS has prepared a draft Environmental Assessment, preliminary Plant Pest Risk Assessment, and preliminary Finding of No Significant Impact, which will be available for a 30-day public comment period (July 6, 2018). The notice is available in the Federal Register. For more details, read the notice posted in the Federal Register. To submit a public comment, visit the APHIS website. Marketing experts Sean Hingston and Theodore Noseworthy from York University answered why consumers don't appreciate the benefits of GM foods and suggested some marketing strategies for GM foods based on field studies. Their article is published in the Journal of Marketing. According to the authors, studies have shown that moral opposition towards GM foods blocks the perception of their benefits. This opposition can be overcome by employing subtle cues to position these products as being manmade. If consumers view GM food as developed by men to be beneficial, then it would be easier to understand why it was developed while moral opposition to the product diminishes. This is expected to lead to increased purchase intentions for the product. This effect is replicated in the field (in both controlled and naturalistic setups), in a laboratory experiment, and with an online consumer panel. The results suggest the use of packaging and promotion strategies that help the consumers to view GM food for what it is (i.e., a manmade product developed with intent). Read the article in the Journal of Marketing for more information. The South Asia Biotechnology Centre (SABC) in New Delhi and the International Crop Research Institute for Semi-Arid Tropics (ICRISAT) in Hyderabad work together to engage key stakeholders in a series of activities that aim to achieve the Prime Ministers' clarion call of doubling farmers' income. Around 45 key stakeholders, including farmers, farmers' organizations, ICAR institutions, SAUs, NGOs, industry associations, and private sector representatives participated in the round table meeting, "Role of Public Private Partnership in Agricultural Research, Technology and Innovation," supported by Bayer CropScience, on June 11, 2018 at ICRISAT, Patancheru, Telangana, India. Recognizing that farmers' profitability and agricultural sustainability are the twin goals of the modern agricultural production system, Acting ICRISAT Director General Dr. Peter Carberry refers to the public-private partnership (PPP) as an important opportunity and asserts for PPP models for resourcing partnership during the inaugural session. Achieving these twin goals requires collaboration between public and private partners-ranging from companies to communities to improve input efficiency and crop productivity and act as a stimulant to growth resulting in improving the income of farmers in India. Given the nascent stage of PPP in agriculture, the emphasis needs to be put on PPP for both upstream and downstream sides of agriculture value chain, said Dr. CD Mayee, SABC president. Increasing yield, improving small farmers' asset productivity and enhancing environmental sustainability amidst depleting natural resources, soil fertility, and climate change need a paradigm shift and a transformative approach in collaboration and partnership. Indian industry representative Dr. Paresh Verma appeals to the Indian government to put in place a conducive policy framework and predictable regulatory environment for a strong PPP in agricultural research, technology and innovation, while Bayer's Rajvir Rathi emphasizes institutional over individual approval for a successful PPP in agriculture research, technology, and innovation. In conclusion, Dr. Sanjeev Jha, of ICAR proposes to develop an institutional mechanism and guidelines, and a clear national policy statement on PPP in agriculture for successful PPP at national and state level with an aim to foster attractive environment, spur collaborative R&D and extension and leverage investment, enhance private sector involvement in agriculture research and commercialization of technologies developed by public sector institutions. For more information about PPP in agricultural research, technology, and innovation, visit the SABC website. Plants integrate seasonal signals such as temperature and day length and use the information to optimize the timing for key lifecycle stages. These transitions include flowering, seed dispersal, and seed dormancy -- a timely tactic used by "mother" plants to ensure seed germination happens in optimal conditions when seedling survival rate is high. Seasonal sensing requires the activity of two well characterized genes, Flowering Locus C (FLC) and Flowering Locus (FT). FLC is a temperature sensor that acts as a brake to flowering and FT is a daylength sensor. New research led by Professor Steven Penfield of the John Innes Centre (JIC), has identified the precise mechanism by which temperature information is passed from mother to seeds. The research shows that the two genes gather temperature information from the environment and share this with progeny during seed set. The team discovered that the mother generates diversity, and uses variation in temperature because as temperatures vary, plants produce seeds that are slightly different in size and number. The research finds that the mother plant exploits environmental temperature variation to create diversity in seed type and behavior - a kind of reproductive bet-hedging in which the plant uses temperature information to create a diverse and widely spread offspring. For more details, read the JIC news release. A new study led by scientists at the University of Essex reveals that increasing production of a common, naturally occurring protein in plant leaves could boost the yields of major food crops by almost 50 percent. In the study, the research team engineered a model crop to overexpress a native protein that is involved in the recycling process called photorespiration. After two years of field trials, they found that increasing the H-protein in the plants' leaves increases production by 27 to 47 percent. However, increasing this protein throughout the plant stunts growth and metabolism, resulting in four-week-old plants that are half the size of their unaltered counterparts. Lead author Patricia Lopez-Calcagno said that scientists have used promoters that express proteins at high levels throughout the plant, but for the H-protein, they realized that more is not always better, and when the method is translated to other crop plants, changes in protein must be to the right levels in the right tissues. The team plans to increase the levels of this protein in soybeans, cowpeas (black-eyed peas), and cassava to increase the yields and opportunities for farmers worldwide, particularly smallholder farmers in Sub-Saharan Africa and Southeast Asia. For more details, read the news release at the Realizing Increased Photosynthetic Efficiency (RIPE) website. Researchers from ETH Zurich led by Navreet Bhullar from the Institute of Molecular Plant Biology have genetically modified (GM) one of the most commonly grown varieties of rice. The ETH researchers developed rice lines with iron increases equaling more than 90% of the recommended iron content and up to 170% of the recommended content for zinc in rice grains. 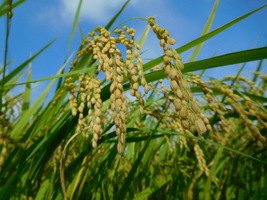 Bhullar and her research team incorporated a genetic construct that expresses a combination of three additional genes into the rice plants. One of the genes facilitates mobilization of iron stored in the plant vacuoles, another encodes for an iron-storing protein Ferritin, and the third promotes efficient iron and zinc uptake by the roots. These plants have been tested in the lab and greenhouse conditions, and will be tested in the field in the near future. "First we have to confirm that the plants retain similar levels of zinc and iron in the grains under the field conditions. Once we've done that, we should assess the bioavailability of these increased nutrients for humans. It can take years before these modified varieties of rice may reach to the public," says Bhullar. For more information, read the news article from ETH Zurich. The legume-rhizobium symbiotic relationship has been widely studied and characterized. However, little information is known on the role of histone lysine methyltransferases in this interaction and in the formation of nodules in the common bean. A study by the team of Aarón Barraza from Centro de Investigación y de Estudios Avanzados del Instituto Politécnico Nacional aimed to understand the mechanism of nodulation control in common bean (Phaseolus vulgaris). The team focused on the role of PvTRX1h, a histone lysine methyltransferase coding gene, in nodule development, and auxin biosynthesis. Using reverse genetics approach, the team generated common bean with knocked-down PvTRX1h expression. Downregulation of PvTRX1h increased the number of nodules per plant, but reduced the number of colony-forming units recovered from nodules. Further analysis found that genes involved in the synthesis of indole-3-acetic acid were upregulated. PvTRX1h downregulation also altered starch accumulation. Based on these results, PvTRX1h likely alters the auxin signaling network to determine bacterial colonization, nodule number, starch accumulation, hormone levels, and cell proliferation in common bean. Phosphorus (P) is an essential macronutrient for plant growth, and is required in large quantities by elite varieties of crops to maintain yields. Understanding how plants can maintain their yield with lower P inputs is highly desirable. The team of Matthew J. Milner from The John Bingham Laboratory in the UK studied the wheat (Triticum aestivum) TaPSTOL gene to learn its role in phosphate nutrition and in other agronomically important traits. TaPSTOL is a single copy gene, which encodes a putative kinase protein, and shares a high level of similarity to its rice homolog, OsPSTOL. The team characterized the expression of TaPSTOL under different P concentrations and found that its promoter was induced in root tips and hairs under P limiting conditions. Overexpression of TaPSTOL in transgenic wheat lines resulted in positive significant effects on root biomass, tiller number, and seed yield, correlating with the expression of TaPSTOL while RNAi silencing resulted in negative effects. Manipulation of TaPSTOL in wheat shows that it is responsible for many of phenotypic advantages as OsPSTOL except for yield. Furthermore, this study shows that TaPSTOL contributes to agronomically important traits, including flowering time and grain size. Several expression systems for multiple gRNAs have been developed in the CRISPR-Cas9 system to induce multiple-gene modifications in plants. The team of Ryosuke Hashimoto from Tokushima University in Japan evaluated the mutation efficiencies in the tomato genome using multiplex CRISPR-Cas9 vectors consisting of various Cas9 expression promoters with multiple gRNA expression combinations. In tomato calli induced with these vectors, mutation patterns varied depending on the promoters used to express Cas9. 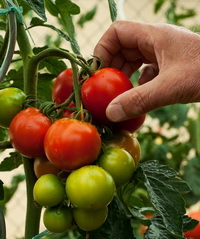 Notably, a high efficiency of mutations was achieved in the tomato genome when the Cas9 was driven by the tomato ELONGATION FACTOR-1α (SlEF1α) promoter. These results suggest that optimizing the Cas9 expression promoter used in CRISPR-Cas9 can improve multiplex genome editing. In land plants, chloroplast transcripts undergo post-transcriptional modifications, including splicing, editing, trimming, before translation. This essential step is regulated by a set of nuclear-encoded proteins. Zhong-wei Wang from the China National Rice Research Institute characterized a rice (Oryza sativa) seedling-lethal albino mutant, sla4. The sla4 mutant exhibited an albino phenotype from germination through the third-leaf stage, and then gradually died. The sla4 mutants also lacked photosynthetic pigments and had severe defects in photosynthesis and early chloroplast development. Analysis showed that a 13-base pair deletion in the coding region of OsSLA4 on chromosome 7 resulted in the albino phenotype. The albino mutants were also generated by knocking-out OsSLA4 using the CRISPR-Cas9 system. OsSLA4 was found to encode a chloroplast-localized pentatricopeptide repeat (PPR) protein. Loss-of-function of OsSLA4 resulted in severe defects in the intron splicing of several genes as well as a significant reduction in the transcript levels of chloroplast ribosomal RNAs and some chloroplast development- and photosynthesis-related genes. These results indicate that OsSLA4 is important for early chloroplast development and seedling growth in rice. For more information, read the article in Plant Growth Regulation. Leaf size is a major determinant of plant architecture and yield potential in crops. However, the mechanisms regulating leaf size remain unknown. The team of Xinxin Tang from the National Key Laboratory of Crop Genetic Improvement in China studied quantitative trait loci (QTLs) for flag leaf length and flag leaf width in rice. Fourteen QTLs for flag leaf length and nine QTLs for flag leaf width were identified. Among them was a major QTL for both flag leaf width and length, Ghd7.1. The team confirmed this via mutants of Ghd7.1 generated using CRISPR-Cas9 which exhibited reduced leaf size. Further analyses also validated Ghd7.1 as a functional candidate gene for leaf size, photosynthetic capacity and other yield-related traits. These results provide useful genetic information for the improvement of leaf size and yield in rice breeding programs. For more information, read the article in Theoretical and Applied Genetics. The reduced mycorrhizal colonization (rmc) tomato mutant is unable to form mycorrhiza and is more susceptible to Fusarium wilt. The rmc mutant has a chromosomal deletion affecting five genes, one of which is similar to CYCLOPS. Loss of this gene is the cause for non-mycorrhizality in rmc, but not the enhanced Fusarium wilt susceptibility. The team of Cahya Prihatna from the University of Western Australia studied a second gene in the rmc deletion, designated Solyc08g075770, commonly expressed in roots. Analyses show that Solyc08g075770 encodes a small transmembrane protein with phosphorylation and glycosylation sites. It is predicted to function in transmembrane ion transport and/or as a cell surface receptor. CRISPR-Cas9 Solyc08g075770 knockout mutants exhibited Fusarium wilt susceptibility like rmc, suggesting that the tomato Solyc08g075770 functions in Fusarium wilt tolerance. This is the first study to show that Solyc08g075770 is a contributor to the tolerance to Fusarium wilt which was lost in the rmc mutant. For more information, read the article in Frontiers in Microbiology. Scientists are calling for use of biotechnology to curb the plastic pollution menace. The call was made during an Open Forum on Agricultural Biotechnology in Africa (OFAB) session held in Kenya as part of the celebrations to mark the World Environment Day on June 5, 2018, with the theme Beat Plastic Pollution. Dr. Romano Mwirichia, a Kenyan university researcher in Microbiology said there is promising research indicating living microorganisms can be genetically engineered to help degrade plastics. "Researchers must come together to look into how biotechnology can be used to make biodegradable plastics to replace synthetic plastics," Dr. Mwirichia said. He said starch should be incorporated into polymers in the manufacture of plastics in order to help disintegrate plastics into fragments that can be broken down by microorganisms in the environment. ISAAA AfriCenter Director Dr. Margaret Karembu echoed Dr. Mwirichia's sentiments observing that as science was instrumental in the discovery of plastics, it should also be employed in finding sustainable solutions to the menace they have created. Dr. Karembu particularly commended the Kenyan government for imposing a ban on the use, manufacture, and importation of single-phased plastics. Francis Mulaa, Professor of Biochemistry at the University of Nairobi called for more efforts to promote industrial and environmental biotechnology saying this will create more jobs and ensure a sustainable and healthy environment. Stakeholders at the forum also expressed enthusiasm at the prospects of research to generate evidence for informing policies to enable biotechnology as it plays a role in plastic waste management. Evans Ondieki, a former Nairobi County Executive Member for Environment, urged the stakeholders to engage champions who will carry the message forward and get the necessary governmental support for funding relevant research aimed at the betterment of the environment. For more information, contact Dr. Margaret Karembu at mkarembu@isaaa.org. The African Union (AU) High Level Panel on Emerging Technologies (APET) on June 8, 2018 launched three reports on emerging technologies setting the pace for Africa to advance its socio-economic development agenda and position itself as a frontrunner in the 4th Industrial Revolution (4IR). The reports, launched at the Africa Innovation Summit held in Kigali, Rwanda, focus on malaria control and elimination, increasing Africa's agricultural productivity and enhancing Africa's energy security. The reports – Gene Drives for Malaria Control and Elimination in Africa; Drones on the Horizon: Transforming Africa's Agriculture; and Micro-grids: Empowering Communities and Enabling Transformation in Africa will serve as valuable resources in unpacking emerging technologies and building a culture of science, technology and innovation in Africa. Speaking on behalf of Rwandan President and Chair of the African Union Paul Kagame, CEO of Rwanda Development Board Clare Akamanzi commended the High Level Panel for the achievement of this milestone and reiterated President Kagame's government's commitment. She urged other Member States to harness emerging technologies for accelerated socio-economic transformation of the continent. Speaking during the launch, APET Chair Prof. Yaye Gassama emphasized the need to streamline regulatory systems in order to ensure timely access and effectiveness of these technologies. She also said there are perceived risks associated with the technologies and called for further research with full participation of African scientists, policy makers and with active engagement of the target communities. One report, Gene Drives for Malaria Control and Elimination in Africa, examines the use of gene drive technology for the control and elimination of malaria in Africa. Gene drive technology has been identified as a potential new option to augment existing interventions in pursuance of achieving the African Union Agenda 2063. According to the World Health Organization (WHO), the African continent is the most affected by malaria, with 90% of the world's 216 million cases in 2016 recorded in sub-Saharan Africa. Read the press release from Africa Innovation Summit. Feed the Future release two videos on Bt brinjal success stories in Bangladesh. Watch the videos from the Feed the Future website.